Our Flying Cloud is 2017, 25" with only 1500 miles on it. I have upgraded the batteries to two 6 volt batteries for longer life. The wheel are special black coated, and I have a new heater and outdoor shower installed. We would neec t know if the renter is towing the trailer, or is asking us to tow the trailer to their location. There is an additional fee for this service, based upon distance and set up. Front Overhead Rooflocker w/Radio • 44" X 80" L-Lounge • Storage Bins Below Lounge (3). (1) Samsung Smart TV. Two 6-Volt AGM Batteries • 7-Way Card Cord Junction Box • 110V/12V Power Center w/55 Amp Converter • 12 Volt ATC Fuses • Incandescent Lighting • 120 Volt Exterior Outlet • GFI Protection For Galley • Exterior Light Pkg. : Dump Valve, Exterior Compartment • Water Pump Switch • Electronic Battery Disconnect • Solar Prewire • Dinette & Reading Lights • Door Light. 20' 30 AMP with converter plug. Two 30 Lb. Steel LPG Bottles w/o Gauges • Automatic 2-Stage Regulator • Water Heater By-Pass Kit • Water Fill • Water Pressure Regulator • Toilet • 39 Gallon Fresh Water Tank w/Drain Valve • 18 Gallon Black Water Tank • 39 Gallon Grey Water Tank • Safety Chain Hook, 11,700# Rating • 740# Hitch weight • Exterior Length - 25' • Exterior width - 8' 51/2" • Interior Width - 8' 6" • Exterior Height w/AC - 9' 7" • Interior Height - 6' 7.5" • Hitch Ball Height -17 3/4" • Heated Tanks - Forced Air • Tank Flush • Sewer Hose Storage Tube • Tank Flush. Travel restrictions Travel is permitted throughout all 50 states and Canada, but not Mexico. Less than 7 days before the start of the rental: 100% of the total rental fee. A $75 cancellation processing fee will be applied to all partial and full refunds. 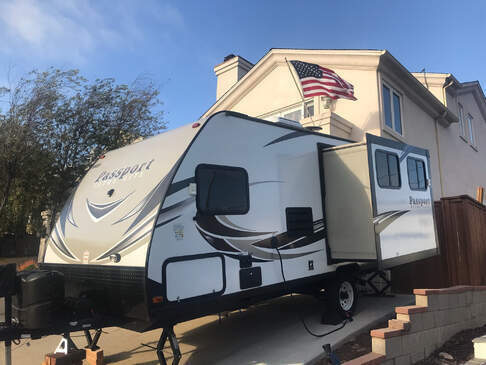 Brand new 2018 Keystone trailer - this is not a motorhome so you will need a truck or SUV that can pull a minimum of 5,000 pounds when RV trailer is loaded. Five star rating in cleanliness. Fully stocked with every thing you need to sleep, camp and cook. TV and audio system is WIFI enabled with indoor and outdoor speakers. 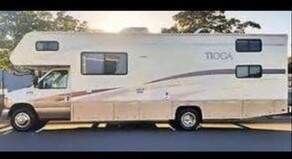 Until I can submit pictures of RV trailer please Google images of "KEYSTONE RV ULTRALIGHT 153ML" to see what this RV trailer has and looks like. Take out our RV to make great family memories! This West Coast Westie takes easy living off the beaten path. Easy to maneuver and fun to drive. Fully stocked with adventure essentials including an organized camp kitchen. 1970s class-A luxury. This Sled is a 30 foot 1977 Apollo Motor home, model 3000-DB (Double Bed). This rig has one pull out couch for two to sleep and a "double" AKA "full" in the rear. 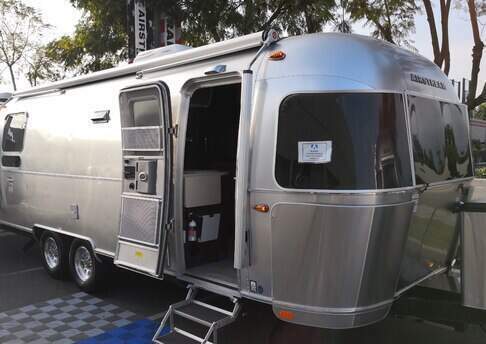 Though, this is a vintage rig, it has a few modern upgrades including, bluetooth streaming media, the AC outlets have been replaced with ones that include USB for charging modern portable hardware and a flat screen TV with aerial antenna. Bedding with extra blankets, cooking, eating utensils, beach towels, fishing rods, an outboard motor for dingy and tow bar rated to 5000 pounds by request. 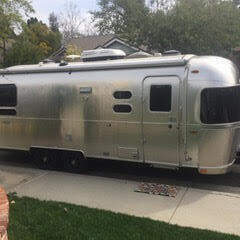 Brand new 25' Airstream Trailer. International model steps up the interior quality of cabinets, faucets, counters, and floors for luxury on the road. 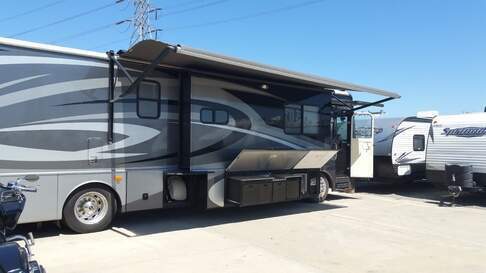 Our unit sleeps a couple comfortablly in a full size bed and above the cab for up to 350 #. It has indoor and ourtdoor TVs for tailgating. We took it across country and had a blast last summer. We have stocked the kitchen with pots, pans, plates, bowls, cups and serving pieces. We make the bed with sheets and blankets as the season dictate. For outdoor entertainment we have a outdoor rug table, chairs, 2 recliners , latterns and propane stove if desired. The awning is automatic. Fully-equipped diesel pusher with sleeping space for up to 6 (seats for 4). 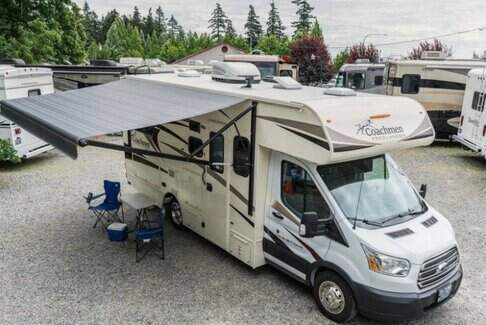 Includes awnings, camping furniture, TV, outdoor shower and bike rack. Sorry, no pets allowed. Mid-sized Ford Tioga (Class C) with room for six people. 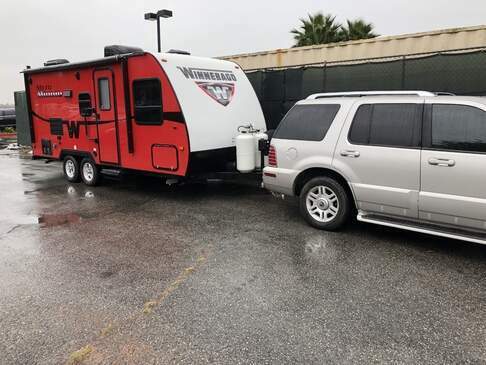 Versatile RV: all the amenities but is still easy to drive. 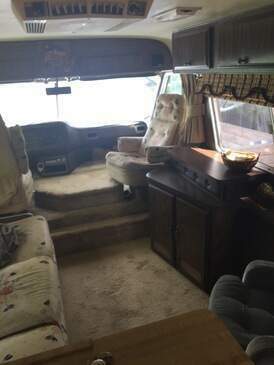 Queen bed, convertible dinette and pull-out couch. Divided bath (separate shower and toilet/sink). Sorry, no pets. The perfect size camper! This Micro Minnie is a very light and easy to tow camper. It sleeps 4 comfortably. It has one queen bed with memory foam and a pull out couch that sleeps two. It has a fully stocked kitchen with all the essentials needed for prepping meals. It has a microwave, oven, stove top and refrigerator. The bathroom has a porcelain toilet and stand up shower. Bathroom is stocked with towels. This rental comes with a Weight distribution hitch/Anti sway bars which makes it tow even better. 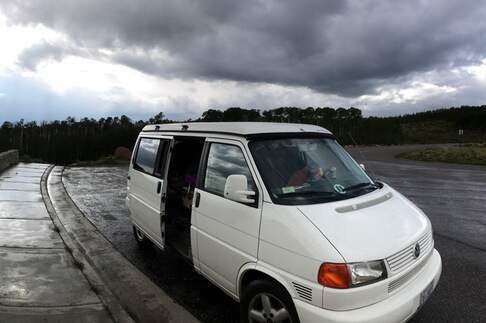 We are at your disposal 24/7 with any questions regarding the functions of the camper. A 3500 watt generator and brake controller available for additional fee. 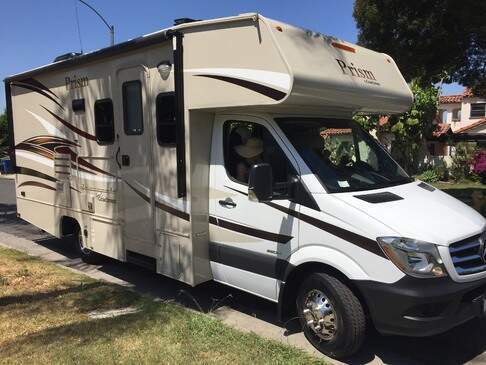 Great little RV for rent near Los Angeles. Easy to drive but with everything you could want for a weekend getaway or camping trip! There’s sleeping space for up to five, but due to the vehicle’s smaller size (which makes it great to drive), two to four people will be more comfortable. There’s a corner queen bed (no master bedroom), cabover bunk and convertible dinette for sleeping. A small bathroom (toilet, shower, sink) and compact kitchen make on-the-road living easy and convenient. Extra amenities are available for an extra fee.